After the super villain Multiplex kidnapped Ronnie’s mother, Joann, Firestorm tracked them to a disused warehouse, where Multiplex tried to use a machine to siphon away the Nuclear Man’s powers to enhance his own abilities. Firestorm created a feedback that disabled the machine and knocked Multiplex out. Now that Ronnie’s mother is free, Jason advises Ronnie not to call her “mom” as the building could be under surveillance, but before they can escape from the warehouse they are attacked by Multiplex’s super powered allies: Hyena, Killer Frost, Black Bison, Typhoon, and Plastique. 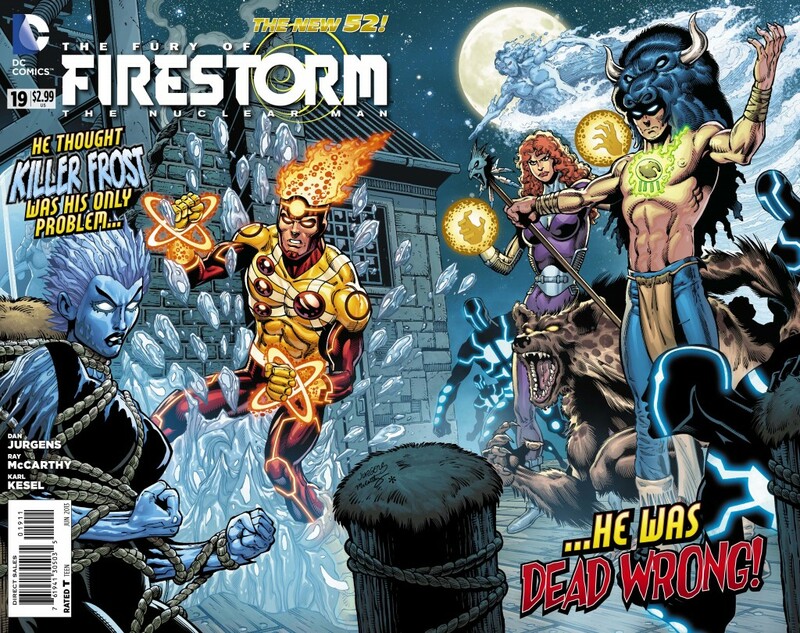 Firestorm tries to escape Killer Frost’s deadly ice shards, doing his best to protect Ronnie’s mother, but a surprise attack by the feral Hyena and a freak storm summoned by the Shaman called Black Bison drags Joann back and blasts Firestorm out through a window. As Firestorm plunges unconscious into the water by the riverfront warehouse, Jason’s dad and Tonya drive to the scene, realising that Ronnie and Jason have walked into a trap. 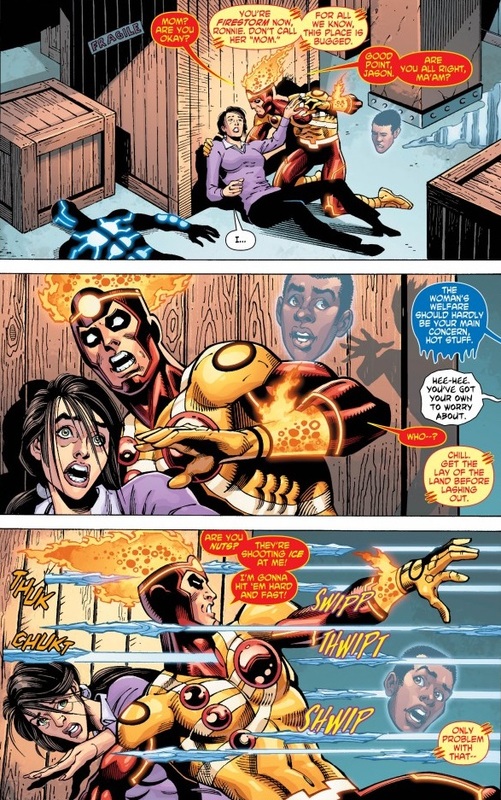 Having recovered quickly Firestorm attempts to return to the surface, but he is attacked underwater by Typhoon, who creates a whirlpool that punches Firestorm out of the water, where he manages to free Joann from Hyena’s clutches only to be frozen in ice by Killer Frost. 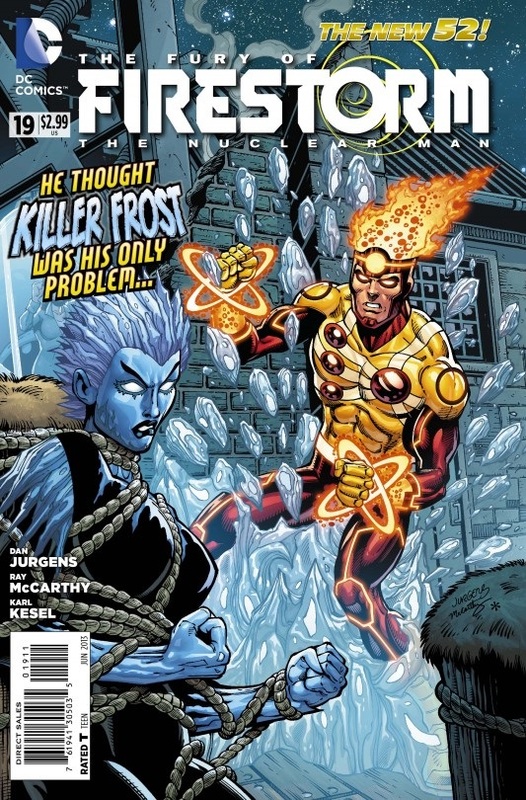 With the ice disrupting Firestorm’s power to transmute matter, Ronnie is horrified when Killer Frost begins to suffocate his mother with ice, and Multiplex arrives and demands more power from Firestorm. The Fury of Firestorm #19 is a terrific issue by Dan Jurgens that sees the Nuclear Man facing not just Multiplex, but almost nearly every member from Firestorm’s rogue gallery! It’s great to see these classic villains return at last. Individually they are Typhoon, who can manipulate water, the deadly and alluring Killer Frost, master of the elements, Black Bison, the savage Hyena, and the explosive Plastique, who together with Multiplex, make up one of the most formidable threats that Ronnie and Jason have ever faced as Firestorm. Its great to see so many of Firestorm’s classic foes in one issue, only Slipknot is missing, and it looks like Jurgen’s has gone all out to include as many members as he can from Firestorm’s Rogues Gallery before the titles cancellation. It would seem that General Eiling has been true to his word, perceiving Firestorm to be a threat, and has dispatched another operative to take Firestorm out. However, we will have to wait until next issue for this climatic final battle. This issues cliffhanging ending is one of the series most explosive yet. After the devastating explosion at the warehouse we have no idea if Joann has survived, or who General Eiling has sent after the Nuclear Man, but I’m sure Dan Jurgens will have a few more surprises in store for Firestorm before the series ends. Every book released by DC in April has been given a special pull out cover to really showcase the art and storyline of each individual comic. This issues fantastic gatefold cover by Jurgens, McCarthy, and Hi-Fi is also another highlight of Firestorm #19, and its one my favourite covers released this month by DC Comics. Although I’m still saddened by DC’s decision to cancel Firestorm, I think Dan Jurgens and his talented team have done a fantastic job with the book, and have ensured that Firestorm the Nuclear Man will go out in fine style!